Judie 對於什麼都有興趣，喜歡團隊合作和旅遊。現在是瓦特台灣同學會的公關， Business Idea Generator 的 founder，同時還是瓦特交響樂團的打擊樂手。用一個電影角色來形容 Judie 是勇敢傳說裡的 Merida，因為她很勇敢的改變了自己的命運，而最喜歡的話是臉書營運長 Sheryl Sandburg 說的 "what would you do if you weren’t afraid?" This talk is sponsored by Mr Ho. He wants to encourage people to live their life more considerate. Production assisted by IOH Helper Jenny Hsueh and Shieh Tsai-Ying. Edited by Leo Lo. Revised by Lily Lin. Judie Wang is a Taiwanese student who started her overseas study as soon as she graduated from junior high school. 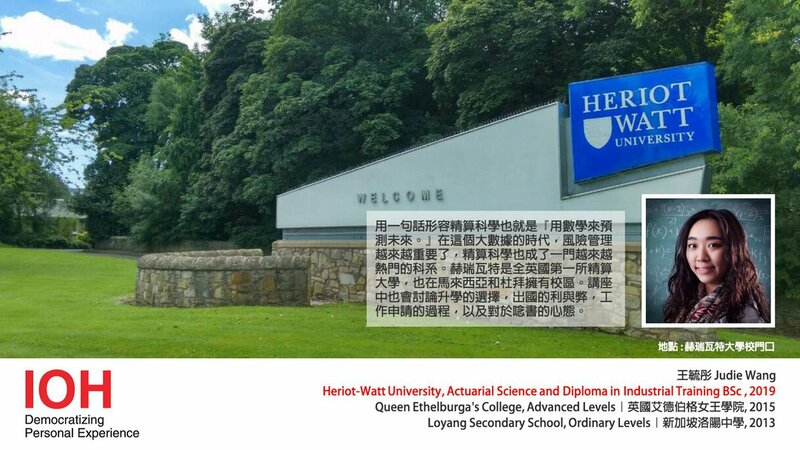 After studying at Loyang Secondary School in Singapore and Queen Ethelburga’s College in York, Judie got enrolled in HWU (Heriot-Watt University), majoring ASDIT (Actuarial Science and Diploma in Industrial Training). Going abroad and choosing HWU over LSE (London School of Economics and Political Science), one of the best schools in the world, it’s a hard choice and requires considerable courage to make the decision. This enables Judie to experience a much broader world than others in the same age do. HWU locates in Edinburgh, the capital of Scotland. Mentioning Scotland, to Judie, “kilt” is what first came into her mind. The horrible weather takes place not only in Edinburgh, but the whole UK, featuring strong winds and heavy rains. The high density of coffee shops in Edinburgh is comparable to 7-11 we have in Taiwan. There are myths about how bad the British food is, but Judie can assures you that they are wrong; for instance, Haggis, the famous dish in Edinburgh, tastes delicious! Ranking 34th in Complete University Guide, HWU has 3 campuses which locate in Edinburgh, Dubai, and Malaysia respectively. The teaching crew in HWU is strong and offers what you need when learning. In HWU, there are 4 famous courses: actuarial science, brewing, petroleum, and chemical engineering. The diversity of the students gives you a chance to exchange experience with people from different cultures. Moreover, beautiful view in the campus give you choices of studying fields other than library, you may go by the lake to study and have a picnic with friends. As for accommodation, the dormitory called Christina Miller is where Judie lives, she enjoys the space there pretty much. What is Actuarial Science and Why? ASDIT is a course under MACs (school of mathematics, actuarial, and computer science). Actuaries assess the risk and minimize it before an event took place, whereas accountants record all financial activities after an event and analyze them for future decision. Judie’s choice of ASDIT is based on her interests in mathematics and A-level economics, and also her realization of how important travel risk is after six-year studying. HWU is the first university providing courses about actuarial science, and what makes it even more special is that HWU provides the courses with industrial training, which offers you a chance for an oversea internship. In HWU, there are 3 different courses related to actuarial science: Actuarial Science, MSAS(Mathematics, Statistics, Actuarial Science), and ASDIT. In ASDIT, a subject might be given by 3 ways: lectures, tutorials, or computer labs. Lectures are the most frequent way which students simply take notes during the class. On the other hand, tutorials are lessons for students to ask and discuss questions. Computer labs are for some certain subjects, such as R, Excel, and Matlab. Projects, weekly quizzes, and examinations are the 3 common ways for lecturers to evaluate students’ learning progress. Examinations determine whether you get the exemptions for actuarial qualifications or not and therefore becomes the most important part throughout the courses. There are 8 exemptions for doing actuarial science, so students do 2 exemptions per year on average. In the class of “Probability and Statistics A”, Judie learned the importance of “R” and started applying it to project-making and examinations. In addition, the way of tutorial lecturer adopted in this course was really interesting, she divided students into groups and asked them to recommend her a question every single week. Judie described the lecturer’s tutorial as tricky since students often spent hours doing her sheets but ended up finding a much simpler way to solve the questions. The course also introduced the way using diagram to analyze mathematical questions which Judie found it really understandable and useful. Judie was a founder of BIG (Business Idea Generator), a platform for members to kick start business ideas, and had won the most innovative idea in a competition called Watt Venture. 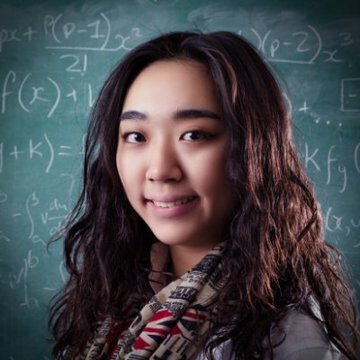 Being a member of career subcommittee in SAS (Student Actuarial Society), Judie’s job was to find out whether there was news worth to be mentioned for increasing business awareness, and the poster competition she attended then evoked her interests in actuarial history. Studying abroad, not only had Judie join ETSS (Edinburgh Taiwanese Student Society), she also created Heriot-Watt Taiwanese Society with seniors in order to build up good and steady relationship among Taiwanese students. Once performed Carmen in the beginning of the academic year, Judie is also the percussionist in the school orchestra. There are lots of events in Edinburgh, including workshops, social events, conferences, etc. Hence, Judie encourages everyone to attend as many activities as you can. Besides time management, the cultural shock is also an important gaining in these years. First of all, the western society owns a different definition of politeness comparing to Taiwan. We viewed politeness and friendliness as the same thing, but to westerners, friendliness is only for the closed ones, and politeness alone is enough for those you are not familiar with. Second, the western education system works in a totally different way than ours. In Asia, students are taught to do something but never have a chance to know why they should do so. Take Judie herself for example, when studying in Taiwan, she received only poker face from teacher when she asked questions. However, in the UK, teachers pushed Judie to go forward in her work and encouraged her to ask at the same time. The steps themselves are surely important, but only if we get to know why these steps take place can the whole process be meaningful to us. Study is never about memorizing the entire textbook, but about learning the logic behind the knowledge and the theory. Judie emphasized that “attitude” is the most essential element when going abroad. In a foreign country, you have to keep “survival of the fittest” in mind, trying to fit yourself into the environment in order to survive since no one has the responsibility to help you anymore. Working hard is a vital task indeed, but remember to play even harder! Like what Merida in the movie Brave had said, “Our destiny is within us. You just have to be brave enough to see it.” Although going abroad takes quite a lot of courage, once you get out of your comfort zone and get into learning zone, you will definitely harvest more than what you have expected!